Golf Card International was founded in 1974 with a simple idea: find a way to help golfers save money on the high cost of green fees. To do this, we formed a club for avid golfers and built a network of affiliated golf courses that would provide savings to our card holders and over 40 years later, Golf Card is still going strong & accepted at thousands of courses in the US, Canada and the Caribbean. Thank you for being a valued part of Golf Card International's success! Illinois has some of the best Courses and Resorts in the Midwest. It will soon be the perfect weather to go out and enjoy a round (or two) of Golf. With your Golf Card International Discount Golf Card, you can save hundreds at 110 courses in Illinois alone! With courses located all across the State of Illinois, you should not have a problem finding a course or 'squeezing-in' that round. 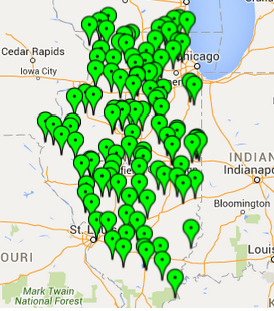 Click Here to see all of the Golf Card International participating Golf Courses in Illinois. 15 Free Rounds to all Golf Card members at all Warrior Golf managed Properties. Simply Click Here and visit all of the Warrior Golf Courses. One year (12 issues) subscription to Golf Digest Magazine included with most memberships. Receive your Hole-in-One honors and certificate in our special "Ace Place". office@golfcard.com or call us at 1-800-321-8269. We will contact these courses and do our best to enroll them. you are on Facebook, stop by and "Like" us too! If you are interested in advertising your course, product or service, contact us at office@golfcard.com.